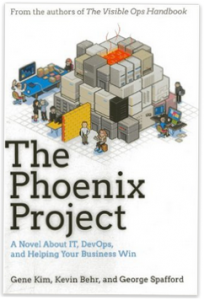 Book Review on Gene Kim’s Phoenix Project. What did you think? It reminds me a bit of the Who Moved My Cheese series of books. Good idea, but then taken probably further than it needs to be with examples. I am surprised the featured character didn’t jump off a bridge or spontaneously combust through all of it. You definitely walked away with wanting one of those Change War Rooms. I think it clearly highlighted the value of that control and risk mitigation that good change processes manage.